Land Tenure: How to lease, rent, or buy farm land? It's our opinion--and our experience--that the primary hurdle facing new farmers is secure, long-term access to good farm land. Without this, it's impossible to build and maintain the soil health and infrastructure that a farm business depends on. Access to capital and training are obstacles that all entrepreneurs face, but the competition for land that faces a farm start-up is a unique hurdle. A grower can develop the experience, finances, and plan to succeed, but it's reckless to gamble that success on unreliable or short-term tenure. We spent years looking for land before settling where we are, and we consider ourselves incredibly lucky to have found the situation that we did. Food is something everyone needs, and farms make food. Even if you don't care at all about preserving open space and farmland, even if you place zero value on a diverse landscape and healthy communities, if you eat you need to care about farmland. We wrote the bulk of this page while we were still searching for land, as a tool to explain to landowners and lessors why tenure is critical for a healthy farm. While we've found a home, many farmers are still searching in vain, or farming in an unstable situation, and the problem is only getting worse... so we've left this information up. Hopefully it sheds some light for you. The security and viability of an organic farm is dependent on the strength and vitality of its soils. Just as a house rests on the integrity of its foundation, an organic farm rests on the health and resiliency of its living soil. There is a maxim in the organic world to "feed the soil, not the plant." When the soil microbes, fungi, and bacteria are in good health, living in healthy tilth with the right balance of minerals, air, and water, you will have healthy, vigorous, productive plants. 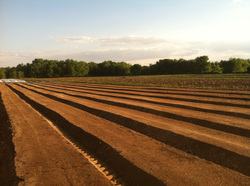 This soil health--and the security inherent in it--can only be achieved with years and years of careful stewardship. It requires not just time, but also the financial burden of sowing fields in season-long cover crops to replenish nutrients and build organic matter, and foregoing the income those acres could provide in the short term. These are big picture investments that can't be recouped, and time that can't be reclaimed. "Conventional" farms can short-cut some of this by dumping large amounts of chemicals into the soil to provide for a plant's needs. This does nothing to maintain the complex web of life that gives soil its structure and resiliency, so that web dies. Without it, we see erosion and a lack of productivity that will take decades to restore. And the big plants this approach creates in the short-term? They're like the obese children at WalMart sucking down soda and Big Macs--huge, yes; healthy, no. Like the child, these plants are prone to disease and pests, requiring huge doses of pesticides, fungicides, and herbicides to even reach maturity... and if you think these Big Mac fed plants are as healthy to eat, you're kidding yourself. They're malnourished and bloated and are yielding similar people. Healthy, delicious food comes from strong soil; strong soil comes from responsible management; responsible management comes from long term tenure. A successful diversified vegetable farm also needs a significant amount of infrastructure: Buildings to wash and pack produce, structures to store equipment and materials, shop space to maintain tractors and vehicles, greenhouses, office space, etc. There are semi-movable compromises for some of these, but they're just that: compromises. Rather than choosing infrastructure that best fits the farm's needs, a landless farmer must choose infrastructure that best fits the back of a flatbed. Rarely are the two the same. There are also infrastructure investments that simply have no moveable alternatives: wells for washing produce, utility infrastructure, buried drainage lines ("tiles") in the fields, underground water mains for irrigation. Even money to improve existing infrastructure is an investment that can't be reclaimed. Historically, land tenure in the US has meant that a farmer owned his land, having inherited it or purchased it on the open market as a regular homeowner might. Given the skyrocketing prices of real estate surrounding metropolitan areas--driven by development pressure as well as the market for "rural estates" and second homes--this is simply impossible for today's new farmer. It's not just an inability to produce such a large down-payment: It's that even a well-run operation with established markets would be unable to service the mortgage on a market-rate purchase price. For a start-up, it would be ludicrous to take on such a burden. As the prices rise and the remaining farmland dwindles--at a rate of 2 acres PER MINUTE according to American Farmland Trust--this situation only gets worse and worse. The most conventional option is purchasing land whose market value has been reduced through a conservation easement (also called sale of Private Development Rights). Think of property ownership as a bundle of rights that a landowner has to a given parcel--the right to build a home, construct a subdivision, plow a field, drill an oil well. Traditionally, an owner owns all of these rights. With a conservation easement, one of those rights--to develop or subdivide the land--is transferred to a third party (usually the state or a non-profit). The price of this right is the difference between the property's open-market value and it's new, more-restricted value. In a market with high development pressure, that can be the difference between an unaffordable purchase price and an agricultural possibility. This approach still requires significant capital outlay for the farmer, as well as holds him to monthly mortgage payments... but it also offers him the opportunity to build equity through the land and a relatively straightforward ownership arrangement. It also, of course, preserves the integrity of that piece of land for generations to come. The second option is a long-term lease--or "ground lease"--on a property that is owned by a government agency, non-profit, or private entity. A ground lease offers long term tenure (often 99 years) without the upfront costs of traditional purchase. Often a farmer will purchase the improvements on the land (house, barn, infrastructure) but not the land they sit on. When he retires, he can recoup his investment by selling the improvements to the next tenant. Not infrequently there are clauses built into ground leases to ensure that the next tenant also farms the property, or that restrict the sale price of the improvements to an agriculturally affordable level. A ground lease offers less opportunity to build equity, but usually has much lower initial and month-to-month expenses to the farmer. There may be fewer opportunities for new prime agricultural ground leases because the purchasing entity (for instance, a non-profit that would purchase land and lease it out) must foot the entire cost, rather than simply taking on a portion of the value, as with an easement. It is also more burdensome for the lessor/landowner to supervise a ground-lease arrangement as compared to simply purchasing development rights. A hybrid of these two strategies involves a ground lease on the agricultural fields combined with a direct sale of a portion of the land for infrastructure and housing. This variation allows the farmer more ability to build equity and a potentially simpler lease arrangement, but at a higher initial cost. 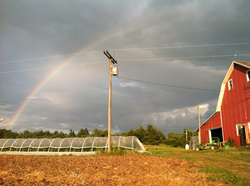 Quincy Farm exists as a viable farm only through the help of the two non-profits who helped us protect the land and bring its price to a level we could afford. Without them, we'd still be landless and searching. Quality farmland is a resource that we as a community--in every sense of the word, from families to towns to states to the world--need to protect. We all need to eat... and there's something to be said for preserving a diverse and healthy environment, too. Mark Twain famously said, "Buy land, it's the only thing they're not making any more of!" We need to "own" the farm land as a community and stop treating it as an individual asset or we're going to have one heck of a problem. Click here to download an excellent two page fact sheet on agricultural conservation easements. Click here to download a sample ground lease. Click here for more information on Equity Trust's book, Preserving Farms for Farmers. Click here for a pdf overview of issues facing owners of agricultural land in New York. ...for further reading, please see our links page.